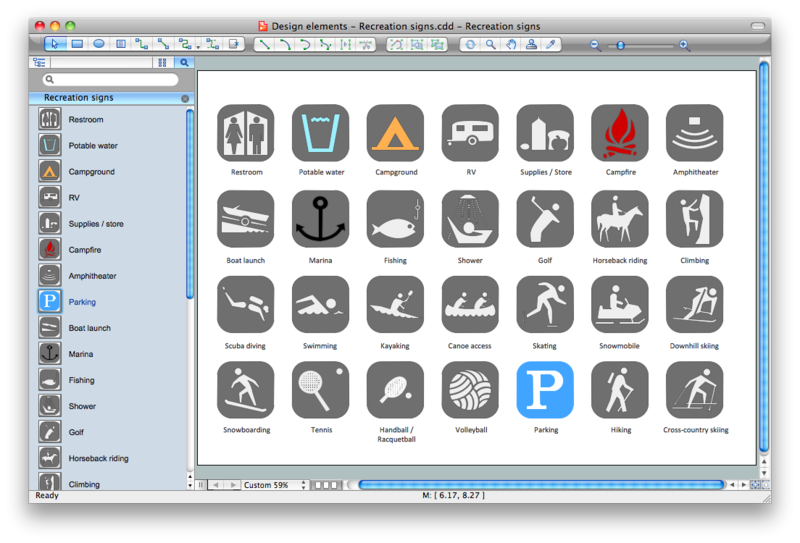 ConceptDraw DIAGRAM is a powerful sign making software thanks to the vector stencils library "Recreation signs". This library is included in the Directional Maps solution from the Maps area of ConceptDraw Solution Park. is very useful tool for professional sign-making business. Use ConceptDraw DIAGRAM and make sure that now sign making is easier and timesaving than ever! "Recreation signs" library from the Directional Maps solution contains 28 pictogram symbols for labeling the street and locator maps, road and route maps, transit and tourist maps with information signs. Nothing could be easier than create new document and drag the ready-to-use objects from the library. Or even use the predesigned sample or template from the Directional Maps solution and fill it to get excellent results in minutes.